No one is nobody. I spun around for one consecutive hour. I stood on an image of a white woman hugging a white man, I in turn held a sing that read:NOBODY. 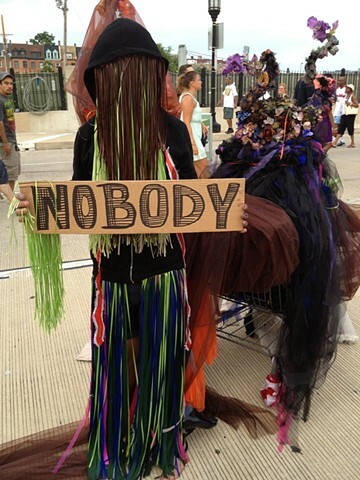 I performed NOBODY on the Penn Station Bridge during Artscape 2013. During the course of the performance I dripped a mixture of mud,purple ink and water on the image I stood on.